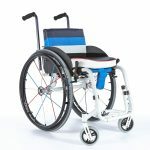 We offer a wide range of mobility products including lightweight wheelchair Leeds. The lightweight wheelchairs are just one of our many creations. We make a range of bespoke children’s wheelchairs as well as powered wheelchair and mobility scooters. We have a number of machines to increase the fitness of the user. The hand cycle is one of our machines which can build upper body strength and is ideal for cycling with friends. It is very easy to operate and has a gear shifter mounted on top of the frame to select the gear most comfortable for your pace. There are three sizes available, a mini seat width of 12 inches, a midi seat width of 15 inches and a maxi width seat of 18 inches. Many of our speciality wheelchairs are manufactured from aluminium or other lightweight materials. 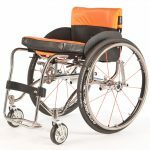 Lightweight wheelchair Leeds can be designed and manufactured to suit a particular need. The frame is usually tough and durable where needed for special off road use and can be fitted with adjustable custom made upholstery. It has a variable or fixed axle and a height adjustable backrest. There are different sizes of castor or front wheels and also a choice of back wheel sizes. The braking system can be standard or hideaway and there is a large choice of powder coated colours. There is a choice of folding or fixed backrests and we are able to have a hand cycle or trail rider fitting attached to the chair according to your requirements. 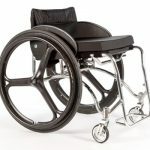 Let us help you to find the perfect lightweight wheelchair Leeds for your unique requirements. We have been custom making wheelchair for our customers since 1990 and most of our customers return to us when they require upgrades to their machines. To find out more about how we can assist you, contact Da Vinci Mobility. We are also experts when it comes to motor vehicle adaptations and are Motability accredited fitters of hand controls which allow our customers to use a vehicle for long distance travel or just to get to work each day. Most of our wheelchairs can be powered or have handles attached. We have over 28 years of experience in creating all types of mobility devices including spare parts for all of them.